Goody (Alicia Silverstone) and Stacy (Krysten Ritter) are best friends, flatmates, vampires and single women in New York. They try to navigate all of this best as they can. They drink only animal blood that they get from their exterminator job and go to Sanguines Anonymous meetings. They have practically no secrets from each other (except Goody can’t really bring herself to tell the recently turned Stacy how old she truly is). They share their dislike of their maker Ciccerus (Sigourney Weaver). But when Goody meets her old flame Danny (Richard Lewis) again and Stacy falls in love with her classmate Joey (Dan Stevens), things will have to be re-evaluated. Vamps may not be quite up to Clueless standards (Heckerling’s previous film starring Silverstone), but it’s an amusing film that entertains. Deciding to watch this together with Byzantium was quite a trip, I have to say. Both have female vampires in the lead roles, but it’s hard to imagine how they could be more different other than that. 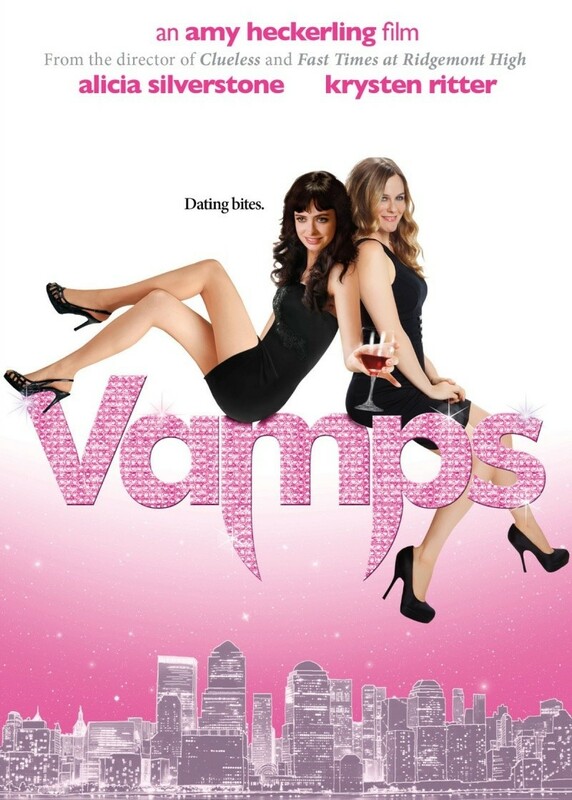 Where Byzantium is all doom and gloom and mostly unfulfilled feminist potential, Vamps is pink glitz with very few feminist aspirations that manages to stumble into them at times anyway. In any case it’s quite nice to have a film that so thoroughly and unapologetically girlifies vampires, breaking them a little out of their goth mould, and being funny while they’re at it. Some things are touched on that nicely play with and re-interpret some of vampiric lore, other things are simply silly. It didn’t quite have me rolling around on the floor laughing, but it was entertaining enough. The film obviously struggled with a small budget – some of the effects don’t look all that good, and a lot of times the sets also don’t look that great, giving it a cheaper, less careful feeling that it doesn’t really deserve. Especially since the frilly pink exterior of the film may lead you to overlook that the film has an emotional heart and does tackle some rather existential topics. It’s not necessarily the most thoughtful examination of those, but it does allow the film to be more than just silly. Summarizing: Not amazing, but fun. This entry was posted in female director, female writer, movies and tagged 2012, Alicia Silverstone, Amy Heckerling, Dan Stevens, Gael García Bernal, Kristen Johnston, Krysten Ritter, Larry Wilmore, Malcolm McDowell, Richard Lewis, Sigourney Weaver, Vamps, Wallace Shawn, Zak Orth by kalafudra. Bookmark the permalink.